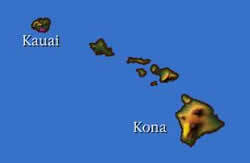 Kona coffee may be more perfectly proportioned than any other coffee bean. This balance comes from Hawaii's famous afternoon shade, which protects the coffee plant from the tropical sun. Kona offers a clean, mild, mellow coffee with just enough acidity to round off the cup. 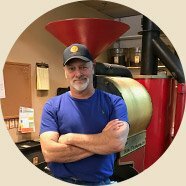 WHAT SAYS OUR IMPORTER ABOUT KONA COFFEE? Hawaiian coffees are grown on new (geologically speaking) volcanic soil in a tropical paradise that is cooled by a gentle Kona breeze. These perfect conditions produce a coffee that is equally perfect in many aspects. Hawaiian coffees are the epitome of balance. Coffee from these lovely islands is clean, mild with a nice hint of milk chocolate, and just enough fruit and acidity to round out the cup. These are not extreme cups, by any means or measure. Delicate, delicate, delicate is the key, and due to the very limited supply, and thus high prices of Hawaiian coffees, we diligently cup Hawaiians to find that perfect mild cup, and not a cup of blandness that is often paraded as Hawaiian coffee. A final note here, and I hate to say it, because of my mantra, "Quality is in the cup" but Hawaiian coffee beans are beautiful when roasted. They roast uniformly, are shaped nicely, just look perfect! Now, I've said it, and I feel a bit ashamed. However, if I ever were to make a roasted coffee display, I would use Hawaiians. 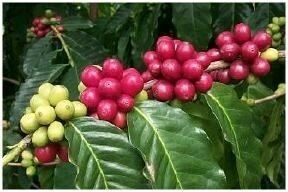 Introduced: Coffee Trees arrived in Hawaii in the early 1800’s. The British warship H.M.S. Blonde brought coffee trees, to Hawaii, from Brazil in 1825. Chief Boki, Governor of Oahu, had acquired coffee trees in Rio de Janeiro, on his way back from London.